1. Set a large wok over a high heat and add 1 tbsp groundnut (or sunflower) oil, then add the garlic, ginger, chilli and macadamia nuts. Once the aromatics start to sizzle, stir-fry briskly for 1 minute then quickly transfer to a plate. 2. Return the wok to the heat with the sesame oil and remaining 1 tbsp groundnut (or sunflower) oil. Add the kalettes and stir-fry for 1 minute. Add the soy sauce and 1 tbsp water. 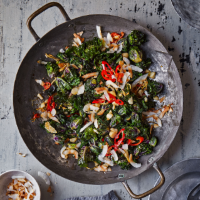 Continue to stir-fry for 2 minutes, until the kalettes begin to soften and no liquid remains. Add the palm sugar and stir-fry for a further 30 seconds. Stir in the lime juice with the garlic, ginger, chilli and nuts, then serve, sprinkled with the coconut chips. This recipe was first published in Thu Jan 24 11:49:05 GMT 2019.